My favorite corn man at the farmer's market still had some end of the season sweet corn so I couldn't resist buying more ears than I could eat. I am not always a soup person (I didn't like the texture when I was little, it has grown on me though) but it just sounded like the perfect meal to compliment the fall crispness in the air. Roast two poblano chile's over an open flame and once they are uniformly charred/cooked and then pop them into a paper bag and fold the bag to close. Set aside. 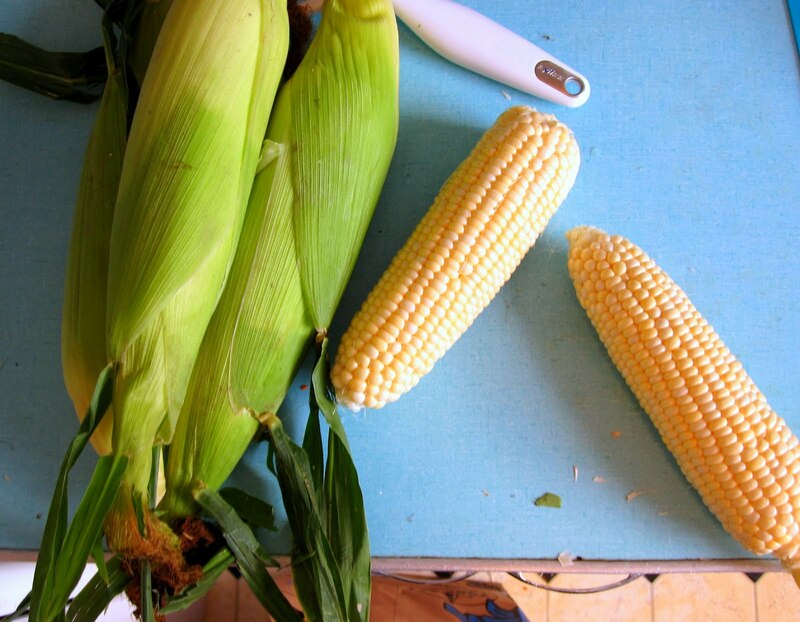 Shuck three or four ears of corn and cut the kernels off. Break the cobs in half and toss them into a pot with 3 cups of milk, a couple sprigs of fresh thyme, two bay leaves, and salt and pepper to taste. Bring just to a boil then reduce and let simmer for 5 before turning off. Set aside. In a separate pan drop a tablespoon of butter and saute chopped bacon (about 1/2 cup). Once browned, add in 2 diced carrots, 1 diced onion, 3 cloves chopped garlic and the majority of your reserved corn kernels (I saved some for garnish - they were delicious raw). Cook over medium heat until the onion is translucent and the carrot is tender. Remove your poblanos from the paper bag and just rub off the charred skin (it should slide right off). Cut off the stem and remove the seeds then chop up the meaty goodness. Remove the corn cobs and bay leaves then place everything in a blender and give it a zap (to your preference - chunky to silky). 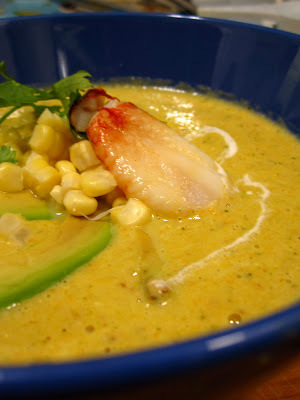 I finished by putting a big lump of crab meat on top along with some fresh sliced avocado, a dollop of creme fraiche and a sprinkling of raw corn kernels (& cilantro! - i put it on everything). I served the soup with sliced radishes and fresh baked biscuits. I am completely biased, being the maker, but I will definitely make this again. One of my favorite homemade meals of late.